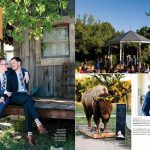 I adored photographing Kellen & Trevor’s Ma Maison wedding this past spring, and The Knot recently selected their wedding as one of their “Texas Weddings We Love” to feature in their upcoming Spring/Summer 2015 issue! I couldn’t be any more thrilled to share it with you, and I am so incredibly thankful to have the opportunity to work with such lovely couples and hard-working vendors to make magical wedding days like this happen! coryryan - Thanks so much James!